Plans are well under way as, in just five weeks time, on 8th September we’ll be in Thanet, gathered together to meet fellow Emptage / Emtage descendants, some of whom will be flying in from other countries for the occasion. Most people are staying in hotels in Margate, arriving on Friday 7th September. With several attendees staying at the same hotel, there will probably be some informal get togethers. Margate has plenty of places to eat if the hotel restaurant doesn’t appeal. How about a stroll along the prom and a fish and chips supper? On the Saturday morning we will begin our exploration of the history of the Emptages by gathering in St Peter-in-Thanet. Through our Wills Project, the earliest records of the family which we have, so far, are of the Emptiach, Emptiage or Emptage, yeoman farmers in St Peter’s. There are copies of 29 wills of people living in St Peter’s between 1489 and 1736, which were either written by an Emptage or which mentioned an Emptage in somebody else’s will. From St Peter’s, the Emptage family began to spread across the Isle of Thanet but it wasn’t until 1537 that wills of Emptages living in other parishes are recorded: St John’s (Margate) in 1537, St Lawrence (Ramsgate) in 1545 and St Nicholas at Wade in 1557. So we can say that St Peter-in-Thanet is our ancestral home, the place where the earliest Emptages were recorded as living, working and raising their families. The official programme starts at 10.30 but people may wish to arrive in St Peter’s earlier, to take a stroll around the village. We will gather in the large community hall at 10.30, when tea, coffee and biscuits will be served. And then we’ll hear four talks by team members and have the opportunity to study the family trees, to mingle and meet close or distant cousins. From the results of the DNA Study, we know that every Emptage or Emtage descendant in the hall will be related, however distantly. We don’t know who the common ancestor was but, given the time scale, perhaps he was from St Peter-in-Thanet. The church is normally closed on a Saturday but one of the church wardens has kindly agreed to open it for us so we can look around the building where so many of our ancestors worshipped and which was the scene of many Emptage marriages, baptisms and burials. 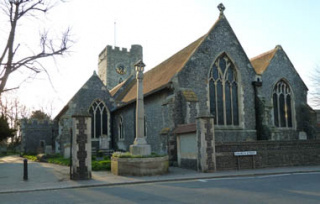 Jill Hogben, author of The History of St Peter-The-Apostle Church in Thanet will be present and will happily sign copies of her book, with the profits from the sales going to the church. The book includes a list of 22 people who died over a two month period, thought to be plague victims. Unfortunately, no year is given but the record has been dated by the British Museum as being from the reign of Henry VIII (1509-1547) or his son Edward VI (1547-53). One of those named is Margaret Empytage, who was buried on 19th October. She was noted as the daughter of Richard Empytage. 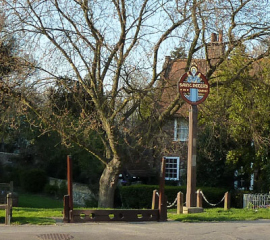 After visiting the church, we’ll be able see the stocks on the village green and hope that none of the Emptages ever committed such a misdemeanour as to warrant a stay in them. And have a group photo taken on the village green, next to the village sign and the stocks. Then it will be back to the hall for a buffet lunch before we start touring Thanet, independently or in groups. Perhaps people will want to explore the towns and villages which feature in the history of their own branch. For those of us descended from the Emptages of Margate and the surrounding area, we plan to spend time in Margate. Originally a small fishing village, Margate claims to be the first of the seaside tourist destinations, when the steam ships and the trains brought day trippers from London to enjoy a day on the beach and to use the newly installed sea bathing machines. As several of us are descended from the mariners who took part in many rescues off the Thanet coast, we have arranged a group visit to the Royal National Lifeboat Institution’s current lifeboat at Margate on the Saturday afternoon. Very close to the life boat house is the memorial to the nine men who lost their lives in 1857 when the lugger Victory turned over on their way to rescue the crew of the Northern Belle. Two of the names on the memorial are William Emptage and his nephew John Emptage. We will also visit the Margate Museum which is set in the old court house and police station. It is a small museum but has an excellent reputation. Amongst the exhibits are medals which were awarded to Albert John Emptage during his time as coxswain of the lifeboat. From my visit five years ago, I remember that there is a model of an ocean going sailing ship. I didn’t know then that my ancestors included a Master Mariner and several people in the Royal Navy who may have sailed on similar ships, so I want to take a closer look at it. The church of St John the Baptist, where so many Emptages trod the path between gate and door over hundreds of years, in happy times and sad, is a must to visit. There is a wall plaque in the church commemorating Elijah Emptage as a bell ringer in 1824 when he was 54 years old. The new Margate cemetery opened in 1857. Pat, one of our team members, has spent many hours unearthing the burial records and solving some conundrums as to who these Emptages were. And, in the process, raising more questions too. That’s the way with family history. For every question you answer, you find another which needs a lot more research to answer. We will all meet again at 7.30 at The Orangery restaurant, Smiths Court Hotel, in Margate for a celebratory dinner at 8pm. The hotel is on the cliff top, over looking the sea. We can work up an appetite by taking a stroll through the gardens on the Esplanade, opposite the hotel. So the programme for Saturday will begin at the Hall in St Peter’s and finish at The Orangery in Margate. And on the Sunday, there will be more places to explore. 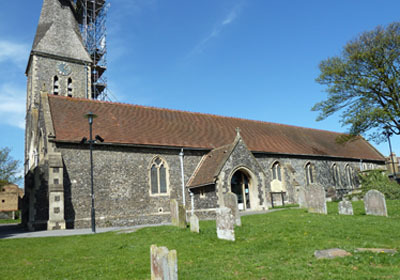 One of the most popular places will be the lovely church at St Nicholas at Wade, where there are several memorial stones to members of the Emptage family. We believe that our name, Emptage, is derived from the Anglo-Saxon words æmettig, æmetig, æmtig. And that, as the DNA Study shows, our ancestors were probably Jutes, led by the warriors, Hengist and Horsa, who arrived on the Isle of Thanet in the year 449, by invitation from Vortigern, King of the Britons, who was under attack from other tribes. Horsa was killed in battle but Hengist became the first Saxon King of Kent. 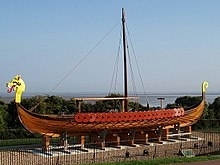 So perhaps we’ll pay homage to our ancestors by visiting the Viking Ship, a Danish replica of a preserved ship dating from 450 years after the Hengist and Horsa arrived on Thanet. It is situated on the cliff above Pegwell Bay, near Ramsgate. I can’t help but wonder what our Emptage ancestors would think about so many of us gathering together in their name, over 550 years since the earliest Emptage will was written in the parish of St Peter’s. If you would like to join us, there is still time to book your place at the Emptage Gathering of 2018. Please as soon as possible.